And now for something completely different. I started this piece a year ago for a new series concept integrating words and pictures (and food). I finally made time to finish it and I’m very pleased with the results. 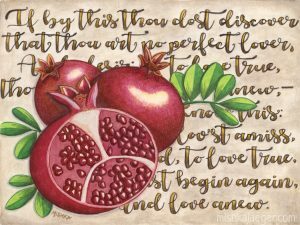 Though I love the recent trend in hand-lettering in watercolors, this lettering is not my hand, it’s traced and augmented from a font called “Autumn in November.” Also I use colored pencils, not watercolor with similar but still visually different results. I think there will be more to come in this series. 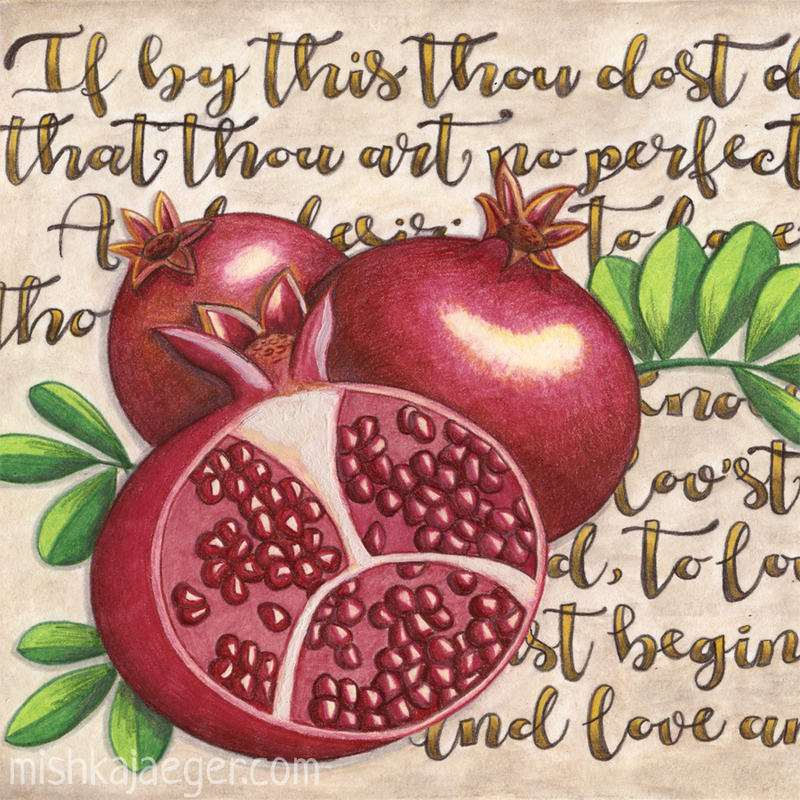 “Pomegranate Love Anew” is a piece about renewal. Early last spring I met up with a friend. She was telling me about how she’d discovered her boyfriend had been cheating on her and that she’d left him but had recently fallen hard for a new love who treated her so well – in ways she was not accustomed to. Originally, I’d wanted to write her a letter and then incorporate part of that into my art. I had been thinking about correspondence and the letter writing that most of us no longer do. I used to spend hours recopying my letters to make sure I had them all exactly right before I sent them. Thanks to computers and email, this is now an arcane art. As it’s been over a year since I began this piece, I decided not to write a letter – I was so far out of that moment in time now. So I searched for a poem that would suffice. I found this from cavalier poet, Sir John Suckling, who – it would seem- was known for irony and wit. As we’re 400 years removed from his original intent I decided to use his words literally. The pomegranate represents life, rebirth and renewal across many cultures. You may recall the story of Persephone where she is tricked by Hades into eating some of the pomegranate seeds and is then obliged to return to the underworld for part of the year, causing winter. Her return from the underworld, from darkness into the light of spring causes the rebirth of the world and the turning of the seasons. Sometimes we have to go into the darkness to be reborn into a place where we are open to our renewal. I heard that my friend has recently moved in with her new love and I wish them well. To my other friends who’ve had a rocky time with their relationships in the past year, this piece is also for you.